Admit it, if you have been a longtime windows users, you would have definitely developed a dislike for the default startup sound on windows. Unlike all other system sounds that can be changed from the windows sound theme settings, the startup sound is the only exception which cannot be changed on windows with the default settings provided. So how would you change the windows startup sound? 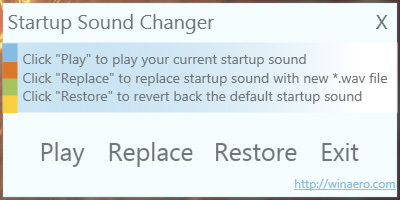 Well there are two ways you can change the default startup sound on windows. The first method makes use of a registry hack, which is definitely something I won’t suggest to novice windows users. Since I have been emphasizing on making things easier for you, I would suggest you to make use of the second method, which is very simple and makes uses of a free program called Startup sound changer to change the startup sounds on windows. As the name suggests, Startup Sound Changer is a free windows program which will help you to easily change the Startup sound on windows without performing any registry hacks yourself, which is maximum cases ends up screwing you Computer. Using Startup Sound Changer is very simple, simply extract the Startupsoundchanger.exe file to your desktop and run it with administrator privileges. Next you will need to select a sound file for replacing the default startup sound and you are done. 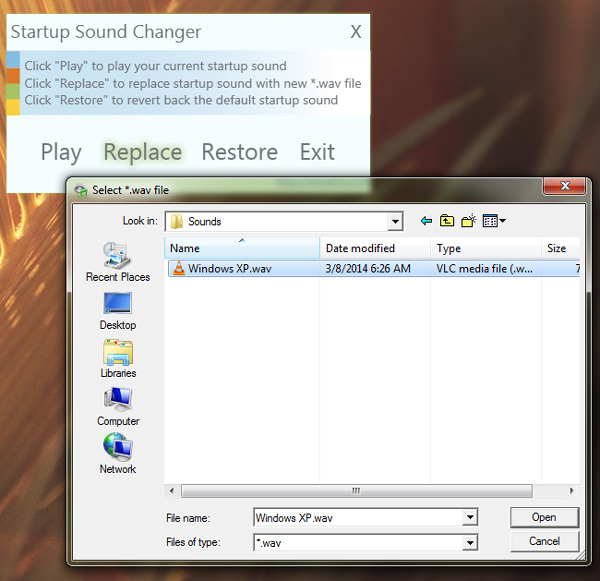 The following instructions will guide you through the process of changing the startup sound on windows using Startup Sound Changer. Note: Since windows only allows you to use wav files for system sounds, make sure you convert your sound file to the wav file format. If you dont have a audio converter, you can make use of Zamzar.com to convert your sound files online. Step 1: Download Startup Sound Changer from the link provided at the bottom of this article and Run the StartupSoundChanger.exe file with administrator privileges. You will see the following interface. Step 2: Click on Replace and select the wav audio file that you want to set as the default startup sound for windows. Finally click on Open. If you need a sample start sound, you can download the Windows XP Startup sound. That’s it and now the startup sound for windows would be changed. Restart your computer and you would be able to hear the new startup sound set by you. In case you want to revert back to the default startup sound, simply click on Restore. Overall, this is definitely the easiest method by which you can change the startup sound on windows. However the program only supports windows 7 and windows vista. Be warned you should not try this on Windows 8 as it will mess up your desktop.